The widow of PC Keith Blakelock has urged anyone who knows about her husband's murder to "search your heart and please come forward". Speaking to ITV News, Elizabeth Johnson said: "None of us will ever give up, no matter what." 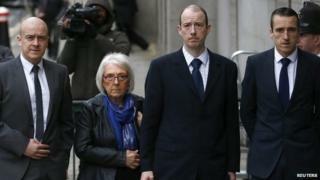 Nicholas Jacobs, 45, was found not guilty of murder and manslaughter of the police officer in April. PC Blakelock was stabbed 43 times during riots at Broadwater Farm in Tottenham in 1985. In an interview due to be broadcast on ITV News on Wednesday evening, she said the family were still coming to terms with how the officer died. "That human being was lying there begging you, please, begging you for his life. And still, you went at him," she said. "You've deprived these boys of a father. Why? Why? "What I find hard to understand is how can people who witnessed what happened to Keith, so many years down the line, have families of their own, how can they carry that on their conscience?" She asked those who knew her husband's killers to tell police. "I would just please ask you to search your heart and please come forward with any information." PC Blakelock, 40, was repeatedly stabbed, and attempts were made to decapitate him, as he tried to protect firefighters tackling a blaze at the height of the unrest on the Broadwater Farm estate on 6 October 1985. In 1987 six people, including three youths, stood trial for PC Blakelock's murder. Three men, Winston Silcott, Mark Braithwaite and Engin Raghip, were convicted but their convictions were overturned on appeal in 1991. Last month Nicky Jacobs was cleared of murdering PC Blakelock at the Old Bailey. PC Blakelock's widow and his three sons Kevin, Lee and Mark, said they were left devastated at the verdict. Speaking to ITV News, Kevin said: "People who do horrific acts like this, should not be able to sleep well at night. "They should always have a thought in their mind that justice will be served one day and the knock will come on the door." PC Blakelock murder trial: Why did the latest case fail? Video PC Blakelock killing: What happened on night of riots? What caused the 1985 Tottenham Broadwater Farm riot?